Background: Despite the well-established benefits of secondary cardiovascular prevention, the importance of concurrent medical therapy in clinical trials of coronary revascularization is often overlooked. 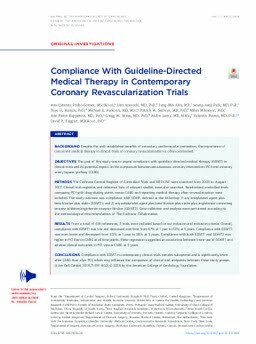 Objectives: The goal of this study was to assess compliance with guideline-directed medical therapy (GDMT) in clinical trials and its potential impact on the comparison between percutaneous coronary intervention (PCI) and coronary artery bypass grafting (CABG). Methods: The Cochrane Central Register of Controlled Trials and MEDLINE were searched from 2005 to August 2017. Clinical trial registries and reference lists of relevant studies were also searched. Randomized controlled trials comparing PCI with drug-eluting stents versus CABG and reporting medical therapy after revascularization were included. The study outcome was compliance with GDMT, defined as the following: 1) any antiplatelet agent plus beta-blocker plus statin (GDMT1); and 2) any antiplatelet agent plus beta-blocker plus statin plus angiotensin-converting enzyme inhibitor/angiotensin receptor blocker (GDMT2). Data collection and analysis were performed according to the methodological recommendations of The Cochrane Collaboration. Results: From a total of 439 references, 5 trials were included based on our inclusion and exclusion criteria. Overall, compliance with GDMT1 was low and decreased over time from 67% at 1 year to 53% at 5 years. Compliance with GDMT2 was even lower and decreased from 40% at 1 year to 38% at 5 years. Compliance with both GDMT1 and GDMT2 was higher in PCI than in CABG at all time points. Meta-regression suggested an association between lower use of GDMT1 and adverse clinical outcomes in PCI versus CABG at 5 years. Conclusions: Compliance with GDMT in contemporary clinical trials remains suboptimal and is significantly lower after CABG than after PCI, which may influence the comparison of clinical trial endpoints between those study groups.